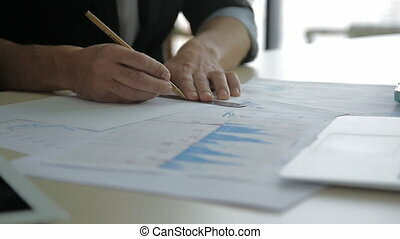 Closeup view of a colleagues financier, trader using a pencil to draw a line on a graph of securities trading. 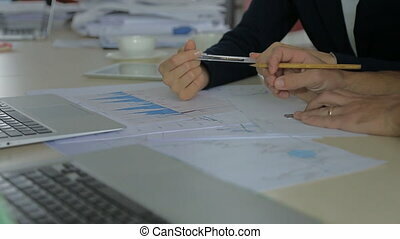 discussing data about business financial documents on office table in front of them. in spacious and bright office with a pad, a tablet, a cup of coffee and a personal laptop. man woman, white-collar workers with modern powerful computers actively take notes in reports and analytics in the past month, a year. Two sales manager, broker, discussing a paper on the table and a pencil to draw a line. discussing data about business financial documents on office table in front of them. in spacious and bright office with a pad, a tablet, a cup of coffee and a personal laptop. 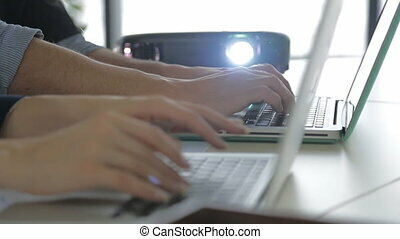 man woman, white-collar workers with modern powerful computers, are actively talking and take notes in reports and analytics in the past month, a year. Close Up Of A Draftsman Drawing Diagram On Financial graph paper. Two laptop computer and colleagues discussing data about business financial documents on office table in front of them. in the office bright and airy with windows to the floor. man woman, white-collar workers with modern powerful computers, notebooks, actively take notes in reports and analytics in the past month, a year. 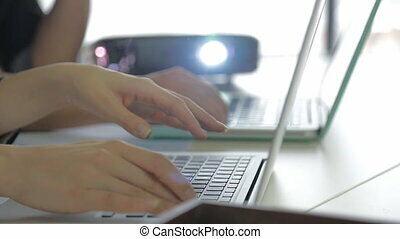 Modern 20s 30s businesswoman man and woman working on a laptop in the office sitting at the table next to each other. they both work on the newest modern computers, between them lies the notebook pad and paper with drawings, occasionally they are doing and the level of entry. 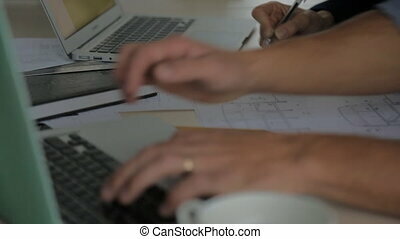 maybe they are builders or architects, entrepreneurs, managers and linguists, financiers, realtors, or electricians. 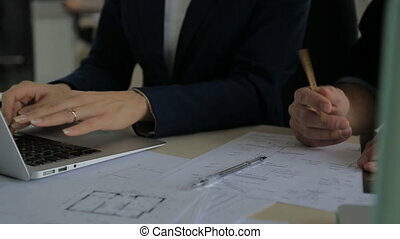 Businessman and Businesswoman beautiful with red hair, sitting at their jobs and talking about a new interesting project, which lies in front of them on the blueprint drawings, diagrams, lay on a big light table in a spacious white office building. maybe they are builders, designers and architects, entrepreneurs, managers and realtors, electricians. 30s businessman business man and businesswoman woman working on a laptop in the office sitting at the table next to each other. they both work on the newest modern computers, between them there is a cup of coffee and the paper lie with the drawings. maybe they are builders or architects, entrepreneurs, managers and linguists, financiers, realtors, or electricians. man specialist consultant talking with his boss beautiful attractive red-haired woman sitting at the table, both in front of a laptop and it fulfills its requirements and wishes in the program on a computer in the office bright and airy room with large panoramic windows. maybe he's a lawyer, a notary, a lawyer or a publisher, editor, programmer or a site administrator, a manager at the company, assistant secretary or translator, accountant, financier, a broker. 20s young man male businesswoman woman helps to solve the problem with your laptop, switch the keyboard layout on her laptop at the office, sitting at the table next to each other. it operates at the new modern computer and have not yet mastered, lie between the paper drawings and the man taking notes at the end of them. maybe they are builders or architects, entrepreneurs, managers and linguists, financiers, realtors, or electricians. 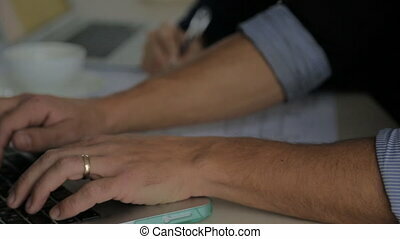 Financiers with laptop in hand and Screen For Mock Up in the office on hand young woman and 30s man. standing on a light table with financial charts on it, laptop with space for text, Perhaps they is a Analyst, Auditor, Chief Accountant, Senior Economist, Chief Treasurer, Head of Planning and Economic Department, Tax Consultant, Finance Director, Financial Manager, Economist, Chief Accountant,. You can replace green screen with the footage or picture you want with Keying effect. Focus on the screen Screen For Mock Up in the office standing on a light table with financial charts on it, laptop with space for text, on the hand young woman and 30s man. Perhaps they is a Analyst, Auditor, Chief Accountant, Senior Economist, Chief Treasurer, Tax Consultant, Finance Director, Financial Manager, Economist, Chief Accountant, Head of Planning and Economic Department. You can replace green screen with the footage or picture you want with Keying effect. 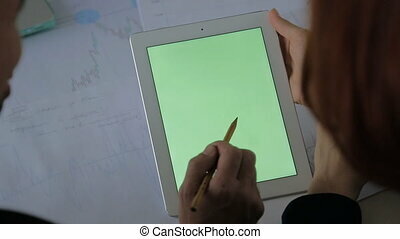 Focus on the screen Screen For Mock Up in the office on hand young woman and 30s man. standing on a light table with financial charts on it, laptop with space for text, Perhaps they is a Analyst, Auditor, Chief Accountant, Senior Economist, Chief Treasurer, Head of Planning and Economic Department, Tax Consultant, Finance Director, Financial Manager, Economist, Chief Accountant,. You can replace green screen with the footage or picture you want with Keying effect.